The Watts Flow Max 4.5 x 10 inch Pleated Cartridge outperform wound, spun, melt blown, resin bonded and other "depth" type filter elements. This is due to the chemically resistant pleated polyester media which provides increased surface area and longer life.The Watts Flow Max 4.5 x 10 inch Pleated Cartridge is cleanable and filters to 5 microns. The length of filter life depending on the level of sediment in the water. The advantage of this pleated surface filtration is that the filter can be removed and washed down with a hose and reused. Therefore it is common for the filter life to be anywhere from 6 months to 2 years. 100% cellulose free synthetic media for increased dirt holding capacity, longer life and reduced filter costs. No additives or binders. Flow-Max jumbo cartridges are pleated for increased filter area, high flow and low pressure drop. 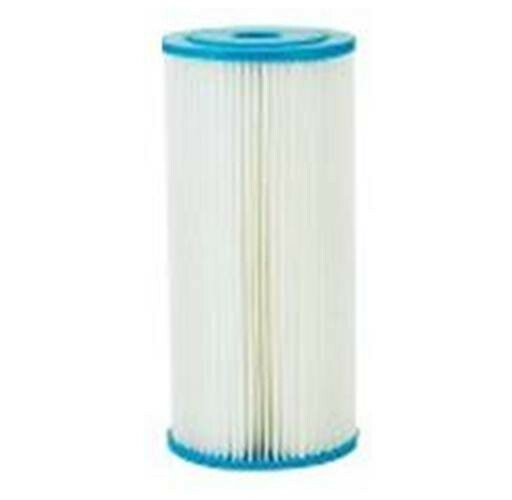 Our engineered filter media is highly efficient to provide superior filtration. All micron ratings utilise 100% synthetic filter media, so there are no adhesives or binders to foam or contaminate.